Raw ideas. Found near scratchpads, blogs, whiteboards, water cooler, tweets, talking after two beers with your boss — all ways to float raw ideas in unrefined form. Many people in business are afraid of half-baked concepts. Messages need to be controlled. Approvals orchestrated. Politics managed. Unbound creativity might be embarrassing. Sure, you’ll make mistakes. But filters block the path to genius. 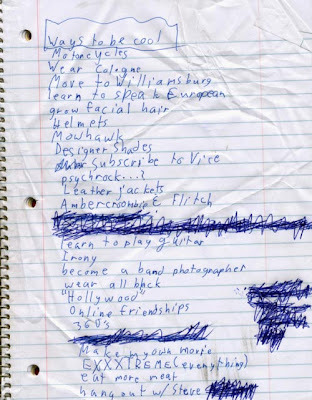 “Ways to Be Cool” via New Shelton. Don’t know if it’s fear as much as they never learned how to do it. Business is about, yes/no, works/doesn’t work, neat and tidy Excel columns lining up. Bill, this post was a flight of fancy, but I do think it’s a serious problem. A case study is GM and Chrysler who are light years behind Toyota and other car-makers in producing green vehicles. If they had been more creative, they would have realized the need to invest a fraction of their profits in electric high-mileage vehicles a decade ago. Businesses large and small get caught up in inertia — staying the same course the produces today’s profits — without looking around the corner. It takes vision to prepare for the unexpected. Vision comes from letting it all hang out and seeing what sticks.